There is no doubt that when a bird decides to widen its own range there is no means to predict not to hinder it and whatever we may think to the difficulty of climate, to the absence of an environment suited to its habits, to the natural barriers such as oceans and mountain ranges or to the possible food shortages that it would encounter due to the presence of species already present in loco since millennia, there is no valid prevision. And if this instinct of expansion is global, impulsive and sudden, here is to appear in short time a real disruption of what probably was a situation lasting since millennia. 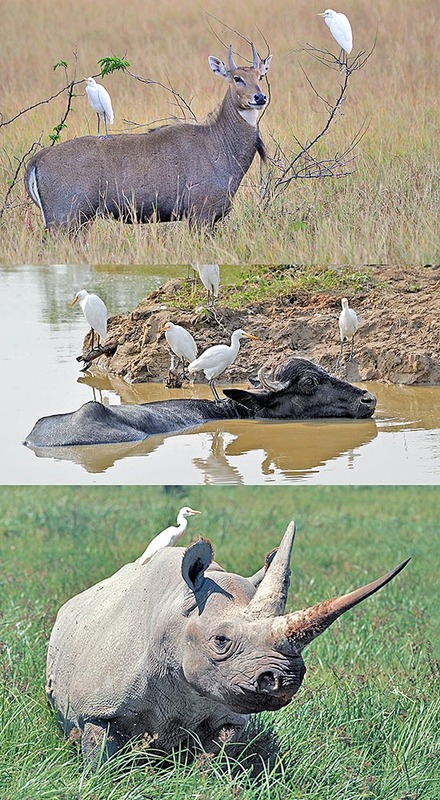 A few decades ago it was sufficient to observe a documentary film about the African parks to see these nice and small white herons walking amongst the buffalo herds or slinking among the enormous legs of an elephant or a times resting unpunished and being transported on the back of some big antelope. For us Europeans this was the only way for knowing this bird so much common in those lands and always so “in-between” while observing the true actors protagonist of these documentaries. So it happened, during the last century that a flock migrating on the African continent, perhaps in a strange wandering or in those particular movements, instinctive for them, called nomadisms, in randomly crossing the Atlantic Ocean, probably helped by the seasonal trade winds and colonizing in the blink of an eye a whole continent. It arrived most likely on the coasts of Brazil or of the Guyanas and found immediately a natural placing in that habitat, so much that in a very few decades has done what we usually see happening at times in many centuries. America has in this way witnessed in its modern history two invasions, the first one wanted and managed by the man, that is Christopher Columbus’ arrival, and the second wanted and managed by the nature. The first, of so-called civilization even if often unnecessarily cruel, the second, totally pacific, without any bloodshed. 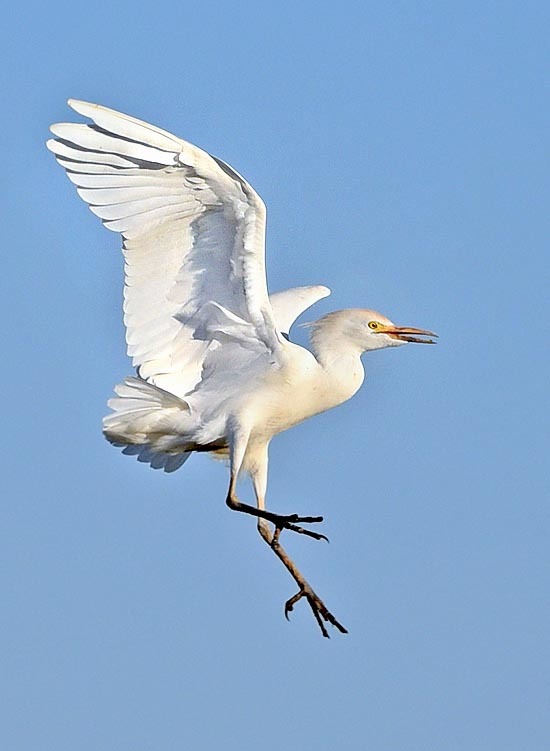 In fact, the cattle egret is till now the only bird having colonized America in modern times without any help from the man. Same thing happened for Europe, till then occupied only in the southern part of the Iberian Peninsula, as well as in the Indian Ocean islands that were systematically invaded and also in the extreme south-east of Asia and in Australasia. This heron has arrived in the most distant islands of the Pacific, reaching even the Fiji Islands. Nowadays, this bird has become cosmopolitan and is even starting the colonization of the sub-Antarctic islands. And by now this nice heron is widely diffused all over the five continents. What can have pushed this bird to widen so suddenly its range may be partially explained by the continuous evolution of the agriculture and of the modalities of cattle breeding done by the man for increasing the production of meat, reasons that can have led it to confuse herds of new and unknown animals with those it was genetically used to live with in Africa or in their world. For them to walk among the legs of the buffaloes or of the giraffes and now among the feet of cows or sheep is absolutely indifferent. The benefit obtained by the first in Africa is perfectly the same as that obtained by the new ones in Central America or other nice locations. To this we have to add the innate versatility of these birds in adapting to any type of feeding which has by sure helped them in their adaptation. In Europe, particularly in North Italy and similar zones, the advent of monoculture farming with a very strong increment of the cultivation of corn and consequent systematic plowing of the cultivated lands, has given strong boost to a new activity for these birds. There is no plowing tractor that is not followed by hundreds of these herons busy in greedily pecking all the insects and small animals taken into the open air by these tireless plows. And so does a mower in grassy meadow. Also in this case for these birds there is no difference between a real live animal or a rumbling mechanical means, the benefit is similar. The Cattle egret (Bubulcus ibis Linnaeus, 1758) belongs to the order of the Pelecaniformes and to the family of the Ardeidae. The etymology of the genus Bubulcus gets its origin from the homonymous Latin term that means cowherd, rightly its preferred activity, whilst the species ibis comes from a misinterpretation given by Linnaeus on the documentation received from one of his fellow countrymen. It appears that some years preceding the classification made by Linnaeus of this bird, the Swedish explorer Hasselqvist when back from an African journey and relying on a wrong trnslation given him by his Turcoman, wrote persuaded that this heron was the old ibis so much worshipped by the Egyptians. Linnaeus followed this indication and in turn continued, unaware, in the error taking it up to our days. 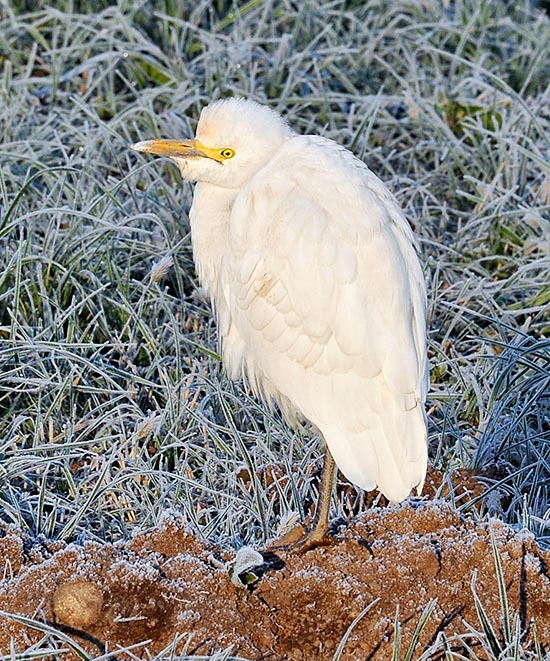 Some common European names are: Western Cattle or Eastern Cattle Egret, in English; Kuhreiher, in German; Garcilla Bueyera, in Spanish; Héron gard-boeufs or Gardeboeuf d’Asie, in French; Airone Guardabuoi, in Italian and Garça-vaqueira in Portuguese. 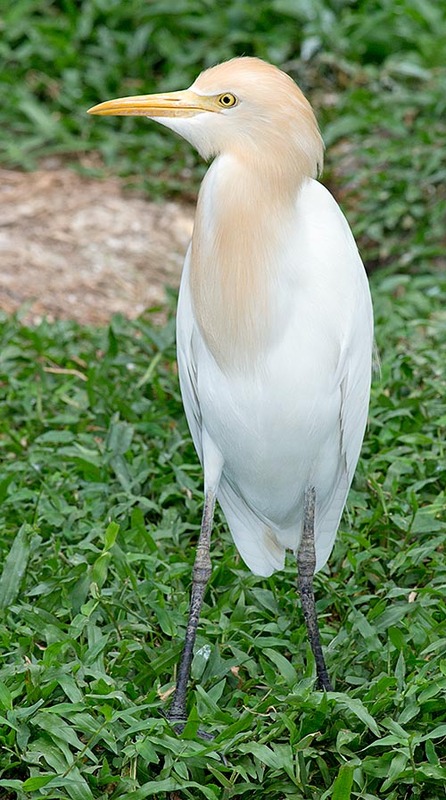 The cattle egret lives in all five continents and occupies a very vast range. In Africa, it is amply present in every corner excepting the deserts. In America, from southern Canada up to the extreme edge of Patagonia. In Asia, it occupies all the Indo-Malaysian and Indonesian areas. It is well diffused in Australia and in Europe it occupies the Mediterranean and southern part of the continent. Its range is expanding gradually year after year and it is thought that in the next future it will occupy all the suitable territories or interested by the agricultural and breeding innovations. The cattle egret is resident in many areas, in others is vagrant and in others migrant. These movements do not have a clear identification even if usually the migration interests the populations living in the north of the ranges or in the limit of areas subject to high seasonal droughts. We witness however to winterings in areas subject to strong frosts or, as is the case in the Australian populations, to a contrary movement bound to the south in cooler areas instead to the milder ones. For sure the seasonal rains or the monsoon ones influence very much its movements and invariably attract in the places subject to these events, huge populations of these birds. Bubulcus ibis ibis, of the old continent. Bubulcus ibis seychellarum, typical of the Indian Ocean islands. This heron lives in the humid zones of the plains, those cultivated even intensely and interested by continuous agricultural works even if in close contact with the man. Herds in the wild and in general places where graze animals, grassy and also abandoned fields, banks of ditches, stubbles and rice paddies, edges of swamps, airports and also arid zones. 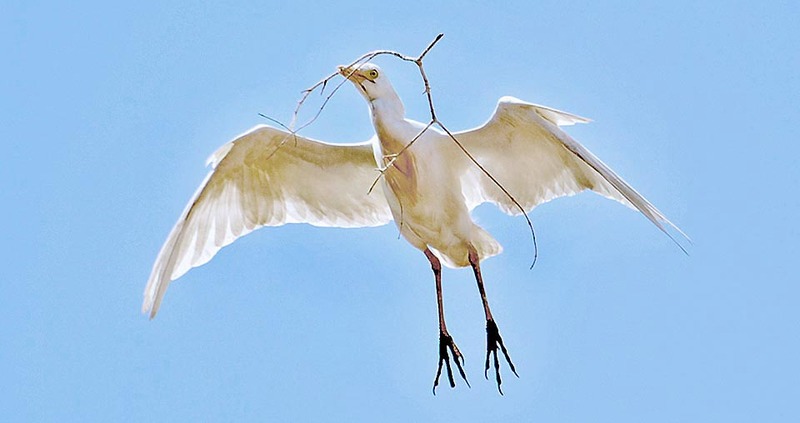 The extreme strong flexibility to any kind of food has led this bird to adapt to the most different habitats. 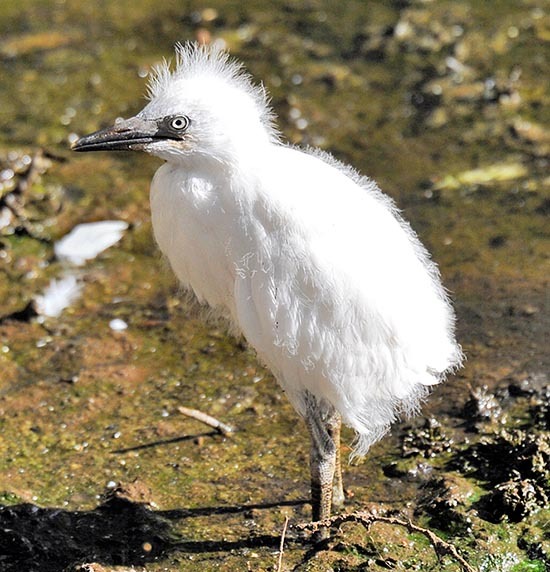 The cattle egret is a small heron with forms more stubby and less slender than its cousins. The neck is much shorter and the body much more massive and roundish, however it keeps the elegance typical to these birds even if when on the ground appears to have a more nervous jerkily gait and with sudden lateral movements. It is not big but it is nevertheless a bird having a wingspan of 100 cm, a weight that may reach the 500 g and a length of about 50 cm. It’s a totally white heron or at least this is the first impression when we observe it from far away or when flying. Actually, its colouration has some ochraceous shades on the head, on the neck and on the rump during the period of nidification that is gradually lost turning pure white by the end of such period. The bill is yellow, robust and stocky and relatively marked. The legs are also green-yellowish, robust and fairly short. There is no distinction between the sexes and also the young assume in short time the adults’ livery. 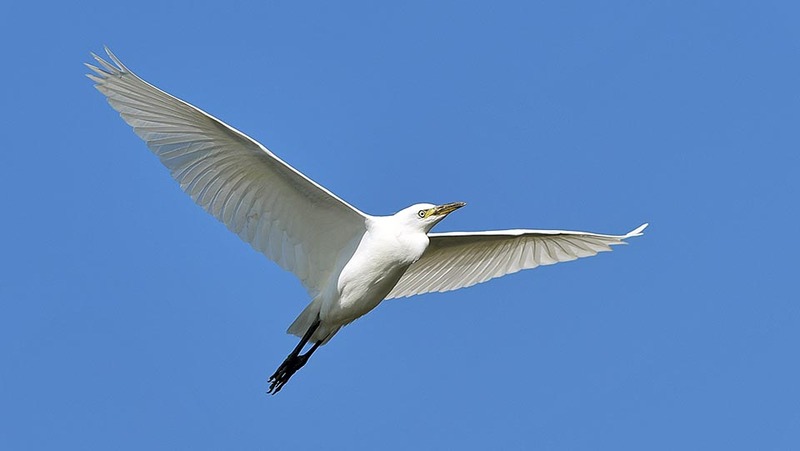 The cattle egret may be at times mistaken with the Little egret (Egretta garzetta) for the size as well as for the colour but an accurate analysis of the bill, yellow in the cattle egret and black in the other and the absence of the yellow gloves typical to the little egret, makes it easier to distinguish the two species. The posture on the ground is rather indicative between the two species and underlines the stocky and blunt shape of the cattle egret against the slender and elegant shape of the little egret. What the typical herons do with their long neck is replaced by this bird with the legs. While hunting, it runs after the preys that moves while walking in the grass unlike the similars that perform waiting and attention huntings. It is more impetuous and hints usually in groups unlike the others that are usually reluctant to the proximity of their similars. It is attracted by the grazing animals and unfailingly as soon as they see any of them, immediately they gather around resuming the ancestral habit of intermingling with them. Besides chasing the insects moved by the animals, it loves to peck them taking off ticks and parasites infesting their hair. Then, tired of walking and wanting to dry their feathers from the dew, here they are, settling on their rump and making themselves comfortably carried while they stretch their wings and do the usual cleaning to the livery. It feeds without distinction of aquatic preys such as little frogs, grass snakes, tadpoles and invertebrates but in the same way seizes land animals like voles and moles, big insects, worms. It does not disdain to predate nests it meets during its continous wandering and also to attack weak or injured birds. 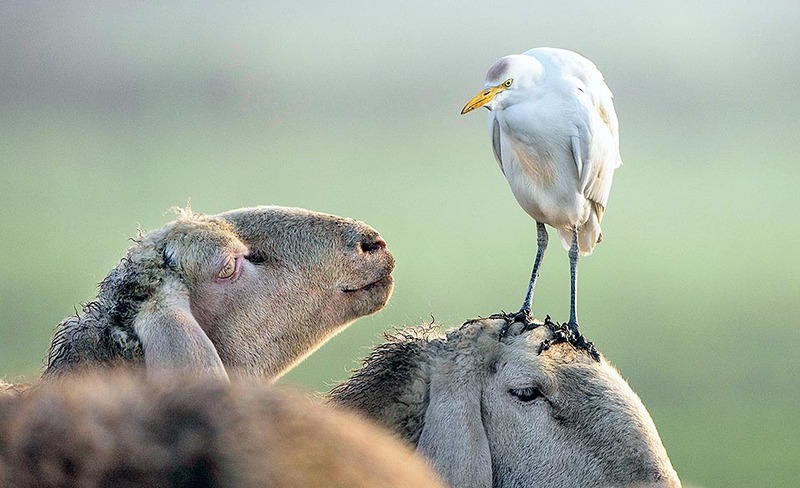 The cattle egret is highly social and spends its life always together with its similars. It does so also during the nidification when it gathers in colonies at times very numerous, placing the nest on trees facing rivers or ponds, thickets among the rice fields and, notoriously, inside heronries mixed with other species of herons. The nidification areas in the boreal hemisphere are occupied during the late spring when back from the migration or from their seasonal displacements. The courting is typical of the herons, with flutterings in front of the female done directly on the nidification site, with curling of the feathers on the head, waving in the beak dry twigs and the whole accompanied by great uproar. Since that moment the colony becomes extremely noisy by day as well as by night, an even more accentuated disturbance at the moment of the birth of the chicks. 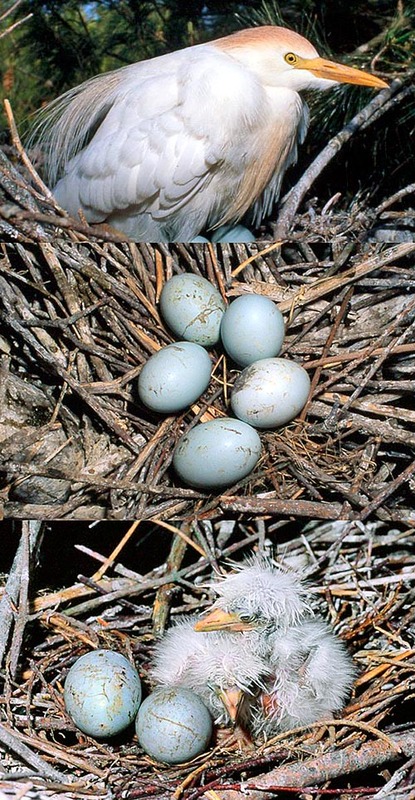 The nest is a platform of dry branches and sedges not too defined and at times unstable so that it is not rare that the kids during their growth fall on the ground fuelling a work of predation by mustelids, rodents and foxes that constantly wander at the foot of the colony. It lays 2 to 5 light blue white eggs that are brooded by both partners for about 25 days. At birth the chicks are covered by a light down but are not able to thermoregulate themselves therefore they must always have the constant assitance of one of the parents but already since the second week of life they can remain alone in the nest for the time necessary to the adults for getting the food, protected only by the mutual assistance given by the colony. When three week old the juvenile livery is completed and the young leave the nest by climbing and venturing on the branches all around the nest until the seventh week when they will become autonomous. Ardea ibis Linnaeus, 1758; Ardeola ibis Linnaeus, 1758; Egretta ibis Linnaeus, 1758; Lepterodatis ibis Linnaeus, 1758; Bubulcus bubulcus Linnaeus, 1758; Buphus coromandus Boddaert, 1783; Cancroma coromanda Boddaert, 1783.